The brother of Dr. Y. Brutskus, he was born in Polangen (Palanga), Courland. At age four he moved with his parents to Moscow. He graduated high school there. In 1892, the Brutskus family, together with other Jews, were expelled from Mexico and settled in Warsaw. He studied at Warsaw University and graduated from the Institute of Agriculture and Forestry in Novo-Aleksandrov (Pulawy). Over the years 1899-1908, he directed the agricultural section in YIKO (Jewish Cultural Organization) and edited its publications. In 1907 he was professor at the St. Petersburg Agricultural Institute. He was active in ORT (Association for the Promotion of Skilled Trades) and an important leader in the realm of Jewish agriculture and statistics. He was involved in loans and credit and with emigration. For YIKO he organized statistical research on the Jewish population. He published important works concerning Jewish economic, statistical, and colonization issues—mainly in Russian. 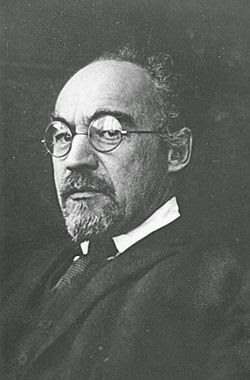 He contributed to Voskhod (Sunrise) and to Evreiskaya zhizn’ (Jewish life). Under the pseudonym “Ben-Dovid,” he published in Yiddish in: Di shtime (The voice), Dos yidishe folk (The Jewish people), and Luekh kedime, among others. He left for Berlin in 1922. He worked as a professor in the Russian Scientific Institute. Together with Yankev Leshtshinski and Dr. Yankev Segal, he edited Bleter far yidisher demografye, statistik un ekonomik (Jewish demography, statistics, and economics), 4 volumes (Berlin, 1923-1924), in which he also published his own research. In 1926 his book Di yidishe landvirtshaft in mizrekh-eyrope (Jewish agriculture in Eastern Europe) appeared (Berlin: ORT), 116 pp. He also contributed to Tsukunft (Future) in New York. After Hitler came to power, he made aliya to Israel, and there he became professor of agrarian economy at the Hebrew University. Sources: Zalmen Reyzen, Leksikon, vol. 1 (1931); Dr. Y. A. Hurvitsh, in Tsukunft (New York) (June 1923); Sh. Ginzburg, in Tsukunft (February 1939). I am almost sure that the family of Brutskus did not eto Mexico, but went to Moscow. It is an error of translation with the cyrillic letters. You're absolutely right. Correction made, and many thanks!